After the capture of Jerusalem by the Crusaders in 1099 some French knights constituted themselves into an Order for the defence of pilgrims on their way to the Holy Sepulchre. In 1118 King Baldwyn II presented them with a house near the site of the Temple and from this was derived their name. From these simple beginnings the Order developed. It was endowed with lands in various countries and preceptories were established thereon to administer them.The Order became wealthy and. alas, some of its members lost sight of the noble aims of their predecessors. Enemies charged them with the foulest crimes and King Philip IV of France - with the connivance of Pope Clement V, and with an eye on the riches of the French province - relentlessly persecuted the knights there. The Templar Grand Master Jacques de Molay, and others were burnt at the stake in 1314 and the entire Order was dissolved by a Papal Bull. Round churches, characteristic of the Order’s building, survive at the centre of London’s legal profession, known as ‘The Temple’, and at Cambridge and elsewhere. There are echoes of the Order in many villages and hamlets whose names (Temple Guiting for example) reveal a former connection, and in places where their secular buildings can still be seen. Theories abound, including some put forward in books by modern scholars, that Craft Freemasonry has somehow come down to us from those Knights Templar - more especially in Scotland - who were able to keep together. The books make good reading but do not seem to have overwhelmed the more established concepts of masonic history. Like that of the Temple, the Order of Hospitallers was established at Jerusalem after the Crusaders’ capture of the city, its purpose being to care for the sick and the poor. It included military knights for defence as well as chaplains and serving brethren. Their black habit bore the eight-pointed white cross of the republic of Amalfi, merchants from which had helped to set up the pilgrims’ hospital which gave the Order its name. St. John the Baptist was their patron. Their later history is complicated, including moves as the centuries passed to Cyprus, Rhodes, Candia and - lastly in 1530 - to Malta. Here they settled and were appointed by the Holy Roman Emperor to be the temporal rulers of the island, being displaced only by Napoleon Bonaparte in 1798. Eventually the Sovereign Order of Malta, as it had become known, made its headquarters in Rome. It is a wholly Catholic organization, enjoying very great diplomatic privileges and even issuing its own postage stamps. Through its Priories in several countries it is still concerned with hospitals and other good works. 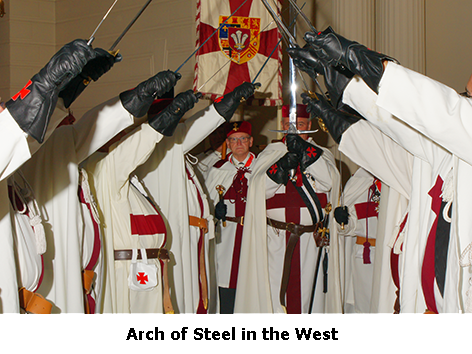 The English ‘tongue' of the Malta Order was revived in 1831 and developed into the Venerable Order of the Hospital of St. John of Jerusalem, which established the St. John Ambulance Association and Brigade through which such magnificent work is done. It also runs a splendid ophthalmic hospital in Jerusalem. The masonic Order of the Knights Hospitaller of St. John of Jerusalem, Palestine Rhodes and Malta can claim no descent from the Order of Malta although its form and ceremonial have undoubtedly been derived therefrom. The above history is an extract from the excellent book written by Frederick Smyth ‘A Reference Book for Freemasons’ (London: QCCC, 1998) and is acknowledged with deep appreciation.